Shiv Sena becomes active since the local administration constantly ignored Hindus’ demand of demolition of toilet ! Kolhapur : Shiv Sainiks demolished unauthorized toilet erected at Manikarnika Kunda within the premises of Shri Mahalakshmi Mandir. The drive was undertaken under leadership of MLA Shri. Rajesh Kshirsagar. ‘Hindutvavadis’ had demanded with local administration, for demolition of the unauthorized toilet on several occasions. The District Magistrate had also issued orders for its demolition but no attention was paid to the order. The local administration has been treating many temples as illegal and demolishing them on the basis of Supreme Court’s orders and on the other hand, illegal toilet was being ignored. The local administration has been evading demolition of unauthorized toilet at holy ‘Manikarnika Kunda’ in temple premises. Finally, Shiv Sainiks had to take the duty of local administration, upon them. 75% of unauthorized toilet has been demolished. Police are yet to register case in this regard. Police are in fact, in panic, owing to suddenness of such act. 1. Pashchim Maharashtra Devasthan Vyavasthapan Samiti (PMDS) did not consult Archaeology Department and carried out changes in ancient structure of the temple. Under this, a toilet was constructed in unauthorized manner at the ancient holy place ‘Manikarnika Kunda’ by blocking its access to devotees, within the premises of Shri Mahalakshmi Mandir. It hurt religious sentiments of millions of Hindu devotees. 2. 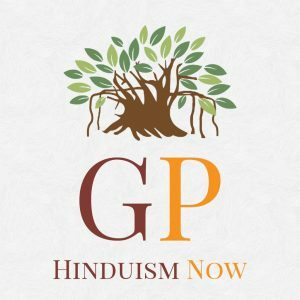 Many pro-Hindu organizations and parties like Shiv Sena, Hindu Janajagruti Samiti, Sanatan Sanstha, Shriram Sena, Bajarang Dal, Hindu Ekata Andolan etc. had staged demonstrations on number of occasions demanding demolition of unauthorized structure of toilet at Manikarnika-Kunda within temple premises. 3.Advocate Veerendra Ichalkaranjikar, President of Hindu Vidhidnya Parishad, its Secretary advocate Sanjeev Punalekar and other ‘Hindutvavadis’ had held press conferences to demand demolition of the said unauthorized toilet and representation for the demand was submitted to the President of PMDS and District Collector. 4. Pro-Hindu organizations staged many demonstrations for their demand of demolition of unauthorized toilet. Similar demand was made by Shri. Rajesh Kshirsagar, MLA Shiv Sena but the Government administration was quite indifferent towards demolition issue. 5. Shri. Mahesh Ursal, city-Chief of Bajarang Dal had written a letter to Dr. Amit Saini, district collector, two days ago demanding demolition of unauthorized toilet. Dispute between Devasthan Samiti and Municipal Corporation over ownership of unauthorized toilet ! It was observed at the police station on 6th June that there was dispute between PMDS and Municipal Corporation over ownership of this unauthorized toilet. PMDS had handed over whole toilet area to Municipal Corporation and had taken a stand that it was Municipal Corporation’s job to demolish the toilet. On the other hand, it was understood that the Municipal Corporation felt since Manikarnika Kunda is within the premises of Mahalakshmi Mandir; PMDS should take up the responsibility of demolition. This led to dispute. Background in brief about drive undertaken by ‘Hindutvavadis’ for protection of Manikarnika-Kunda ! All constructions of PMDS are controlled by Archaeology Department; but PMDS didn’t take permission from this Department for carrying out modifications in construction besides constructing toilet in place of Manikarnika Kunda. On 15th April 2013, the then District Collector Rajaram Mane issued an order for demolition of this toilet; however, the order is yet to be implemented. On 31st August 2013, Hindu Vidhidnya Parishad once again lodged complaint in this regard; still there was no change in the situation. Archaeology Department also did nothing in this case. Shri. Rajesh Kshirsagar, Shiv Sena MLA from Kolhapur drew attention of State Legislative Assembly on the above issue and exposed the problem before all. He also wrote to local administration every now and then demanding demolition. Dr. Amit Saini, District Collector and Municipal Commissioner P. Shivashankar overlooked the problem. 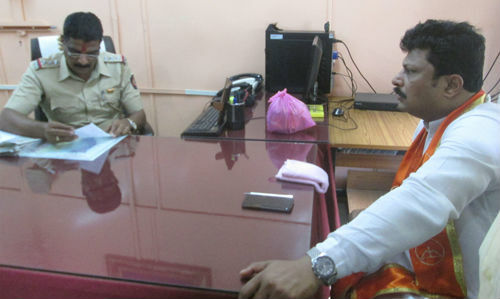 On 9th March 2016, a complaint was lodged on behalf of all ‘Hindutvavadis’ with senior Police Inspector of Juna Rajwada police station demanding filing of cognizable offence and arrest of all responsible officers like Kolhapur’s District Collector, Municipal Commissioner and all Trustees of PMDS but no action has been taken even on that complaint. Finally, the unauthorized toilet was demolished by Shiv Sena. Dr. Saini, District Collector remaining indifferent towards unauthorized structure should resign ! Kolhapur : Shri Mahalakshmi Mandir is an ancient and very important spiritual and archeological treasure of this State; even then a toilet was constructed on ‘Manikarnika Kunda’ resulting in destroying sacredness of the temple and hurting religious sentiments of devotees. Responsibility of maintenance of this temple lies with District Collector Dr. Amit Saini as he is the President of Shri Mahalakshmi Mandir Devasthan Vyavasthapan Samiti. Any kind of construction is prohibited in this place without permission of Archaeology Department. Demand was made several times for demolition of such unauthorized construction; demonstrations were staged but Dr. Saini purposely ignored all the demands and agitations. Finally, with the initiative of Shiv Sena MLA Shri Rajesh Kshirsagar, Devi-devotee Shiv Sainiks demolished this unauthorized construction and it is an outbreak of sentiments of Devi-devotees, stated Shri. Sunil Ghanavat, spokesperson of ‘Shri Mahalakshmi Devasthan Bhrashtachar-virodhi Kruti Samiti (Action Committee)’, its members Shri. Sambhaji Salunkhe, Shri. Mahesh Ursal, Shri. Chandrakant Barale, Shri. Madhukar Nazare and Shri. Sudhakar Sutar, through a press release. It has also been stated in the press release that Kolhapur’s then District Collector Rajaram Mane had clearly instructed to demolish the unauthorized construction of toilet at Manikarnika Kunda. Devi-devotees tried to pursue the matter peacefully for many months but Dr. Saini not only ignored their demand but also in a way supported such unauthorized structure and denigration of religious place. It was therefore, quite natural that one day his dictatorial attitude would face outbreak of Devi-devotees and the day dawned today. Dr. Saini should render resignation at least out of shame for dereliction of duty on his part, his unnecessary interference in religious matters and unpardonable indifference towards devotees’ demands. The Action Committee has demanded his resignation. This matter was exposed by Hindu Vidhidnya Parishad and since then the ‘Action Committee’ has been raising voice against unauthorized construction using different media such as submitting representations, holding press conferences, agitations etc. Shiv Sena’s dynamic MLA Shri. Rajesh Kshirsagar also took up this matter with State Legislative Assembly and local citizens. The outcome of intense discontent amongst devotees and ‘Hindutvavadis’ is today’s outbreak of Shiv Sainiks and it should be treated as a step towards protection of religious kshetra, says the press release. Kolhapur : In a meeting of District Planning Committee, discussions were held on the intense feelings of people regarding Manikarnika Kunda with Guardian Minister of Kolhapur, District Collector and Kolhapur’s Municipal Commissioner about the unauthorized toilet. It was also warned that Shiv Sena would do the job through ‘kar-seva’ method in case the Government machineries failed to demolish the same by 15th April 2016. The matter was pursued with concerned machineries time and again; still no firm action was taken by the Government; therefore, today on the day of ‘Shivarajyabhisheka’, few office bearers and Shiv Sainiks were taken for this drive and raising slogans of “Jai Bhavani, Jai Shivaji” etc., the unauthorized construction was demolished as guerilla tactic. The above information was given by Shiv Sena MLA Shri. Rajesh Kshirsagar from Kolhapur, during a press conference. 1. I hit the first blow of hammer on the unauthorized construction and other Shiv Sainiks demolished all walls, door and other things of this toilet. Municipal councilor Riaz Khan, Rahul Chavan, dy. City-Chief Shri. Ramesh Khade, Shri. Jayawant Harugale, Shri. Anil Patil, Shri. 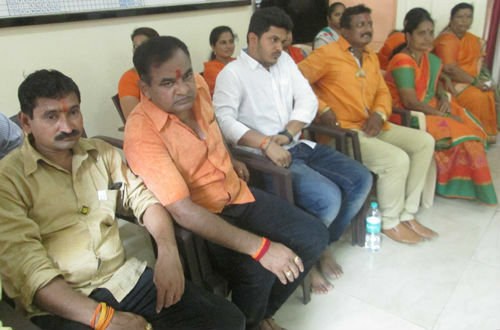 Ranajit Jadhav, Shiv Sena Women Front’s Mangal Salunkhe, Rupali Kavale, Geeta Bhandari etc. were present. 2. Government’s constant indifference was the reason of ‘kar-seva’. 3. Police took us to Rajwada police station after demolition of unauthorized construction. Police started preparations to file cases against us. Police contacted Devasthan Samiti and Municipal administration and called concerned officers to lodge complaint against us; but nobody came forward even after waiting for them for a long time; therefore, police had to release us. 4. Devasthan Samiti’s Secretary Shubhangi Sathe went to police station one hour after demolition. She had discussions with police officers but she too didn’t lodge complaint against Shiv Sena. Take action against PMDS trustees and concerned persons for hurting religious sentiments !